The Magic Carpets of Aladdin - The Mickey Wiki: Your Walt Disney World Encyclopedia! The Magic Carpets of Aladdin is an attraction in Adventureland. The Magic Carpets of Aladdin is a hub and spoke attraction located in Adventureland. The ride is based on the 1992 Disney movie Aladdin, and it is similar to Dumbo the Flying Elephant in Fantasyland.The Magic Carpets opened May 23, 2001 in the newly created Agrabah Bazaar (an expansion of Adventureland) . According to the Magic Carpets of Aladdin's backstory, the Genie bottle that serves as the centerpiece of the attraction was discovered when the well that had previously been located in the center of Adventureland was dug up at the turn of this century . When guests enter the loading area they are able to choose from 16 magic carpets. Riders are also given the ability to choose whether they want to sit in the front row or the back. Front row passengers can control the height of the carpet, while back row passengers can tilt the carpet to the left or right . Once seated, riders are instructed how to fly their carpets before being lifted into the air. The magic carpets fly in circles around the Genie's lamp (which is decorated with characters from Disney's Aladdin) while music from the movie plays. Guests should also watch out for a large camel that “spits” water at the carpets. After 90 seconds the carpets descend back to the loading area and guests exit the ride. There are two spitting camels located near the Magic Carpets of Aladdin. One camel spits water onto guests as they ride on the carpets, while the other one faces away from the attraction and squirts nearby pedestrians. These camels were originally featured in the Aladdin’s Royal Caravan parade that ran at Disney-MGM Studios from December 21, 1992 until August 27, 1995. Following the end of the parade's run, the spitting camels were placed outside of the park's Soundstage Restaurant. The Soundstage Restaurant eventually closed on November 14, 1998 , however the spitting camels were eventually relocated to their current location in the Magic Kingdom during the construction of the Magic Carpets of Aladdin in 2001 . If you want to get hit by the spitting camel, fly your carpet at mid-level. 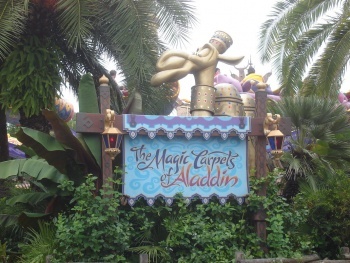 The Magic Carpets of Aladdin was the first permanent Aladdin themed attraction in Walt Disney World. In 2001, the construction Agrabah Bazaar (and subsequently the Magic Carpets of Aladdin) added an Arabian theme to Adventureland that had not previously existed. The Magic Carpets of Aladdin was the first attraction added to Adventureland since the park opened on October 1, 1971 (although The Enchanted Tiki Room (Under New Management) had replaced Tropical Serenade in 1998. This page was last modified on 25 February 2018, at 22:58.